October 23, 1959, Allentown, Pennsylvania. Yesterday I was honorably discharged from the U.S. Army at Fort Sheridan, Illinois, after serving nearly three years. The slightly early release was a result of their not wanting to reassign overseas returnees with less than 90 days left; otherwise my time would have been up on January 14, 1960. In celebration, five of us hired a limo for stylish travel to Chicago's Midway Airport, from which I flew to Philadelphia. My parents met me there. 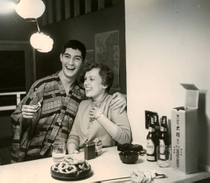 Arriving home in Allentown, I stripped off the uniform, had a few beers, and slept soundly. Next morning, off to the cabin. 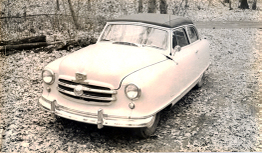 And to a used car lot to get wheels — a yellow Nash Rambler convertible of recent vintage, which set me back 700 dollars. That's it on the right, parked at the cabin. It sorta looked like an inverted bathtub, but it ran well enough and the top went down for fresh air driving. Winter set in and the snow fell. But the cabin had good heat, so as long as we could get cars up the dirt road the fun could go on. Whenever the pond froze over we would go skating. This was especially good at night, so we rigged up lights. 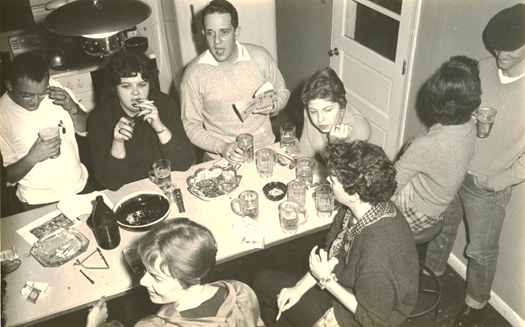 Of the countless cabin parties in the next two or three years, one of the most notorious celebrated the Beatnik movement with lots of beer and readings of very bad poetry. Excuriatingly bad poetry. This party honored my Conquest of Mount Fuji, a feat accomplished in August 1959. The mountain's image is seen on the scroll painting in the photo above. Do not ask what the lady in the upper left corner is doing. Some other images of this event are shown here. Gradually the cabin saw fewer parties as we all got on with our lives. By 1963 they were a thing of the past, although I still used the place once in a while. 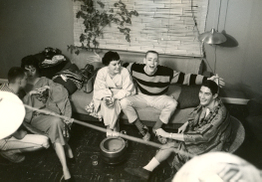 The photo above is from 1964 and shows some of my friends from New York. The guy with the rifle is Tad Wakamatsu, my counterpart at the rival Bert Stern Studio. Others, from left: Nonya Finkelstein, Bridgitte Daval, Makoto Sakai, and — on far right — Tony Daval of French Television. In the next year or two the cabin burned down. RETURN to Personal Tidbits Index. 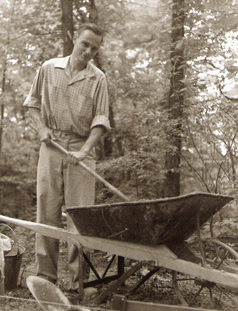 Spring 1954, Allentown PA. I was home on the weekend from my job in New York, and my dad brought up the subject of having a summer home, a hideaway on a wooded mountainside not too far from town. A place to escape to. I was somewhat turned on by this, although building one seemed like an awful lot of work. Actually, it would be something to do over the summer while my employer, Richard Avedon, closed his studio as he spent the season in Europe. By the next time I came home, Dad had already purchased the dream location on South Mountain just above the nearby town of Emmaus. It was on a narrow, twisting dirt road, was heavily wooded, and had a good-size pond at the bottom of what was once a mine hole. He had also purchased a book of cabin designs. One in particular looked attractive, and could be made of standard prefabricated sections. This I liked, as it reduced carpentry to a minumum. So he ordered the pre-fab units, and early in the summer we set to work clearing the site and digging the foundation post holes. That's me on the left, digging. Somehow, a cement mixer managed to find its was up the rutted dirt road, and the foundation posts got poured. Then a big truck arrived with the pre-fab sections. All we had to do was assemble them. With the help of family and friends, all of the walls got put up in only a day. Of course, this did not include a roof or the outer sheathing. That's my dad on the right. The man on the left was an experienced carpenter, so it got done correctly. Over the next few days we rushed to get a roof up and waterproofed. Then came the shingles. Fortunately, the windows and doors came completely finished and in place. This was really quite easy. The interior walls were just frames that had to be covered in drywall, but this was in no rush as we had all summer. Actually, electrical wiring and plumbing came first. I was able to handle much of the wiring, but left the piping to someone else. We had already arranged for the power company to bring a line there as we needed current for power tools from the beginning. One thing we did not have was a good supply of water, so for the time being an outhouse was needed. 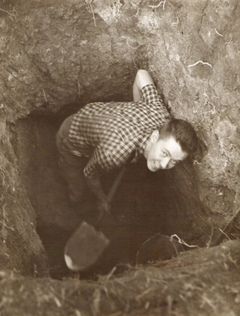 That's my friend Erwin Braker on the left, digging the huge, deep hole for the privy. Later, a septic tank was installed, and the water situation got a little better. It was never really resolved as we discovered that the water table was very, very deep. What we did have came from a spring, and drinking water was brought from home in jugs. 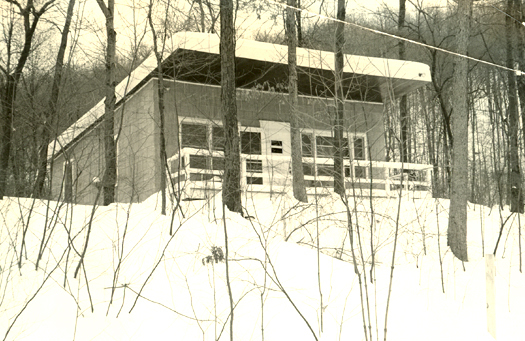 Long before the inside walls were anywhere near finished, the cabin found its real role in our lives. PARTY PLACE! 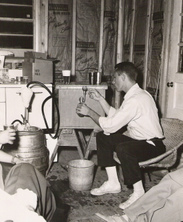 The first kegger happened by the end of summer, followed by countless others over the years. Some very casual, some quite dressy, and often following themes. Here is a photo of that first party. That's my buddy Jack Reno tapping the first of many kegs. Note the unfinished floor and walls. Going to"Earl's Cabin" on Saturday nights nearly became a ritual among the people I grew up with. 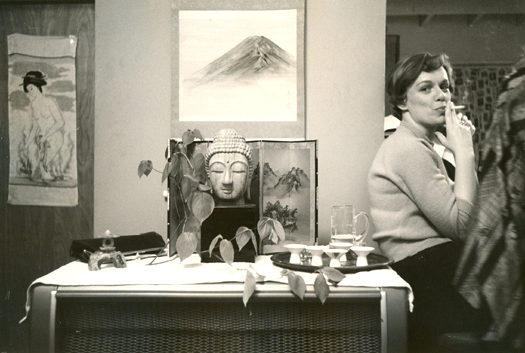 And on weekends when I stayed in New York, my sister Elsa and brother Richard made use of the place. So yes, it saw a lot of use. 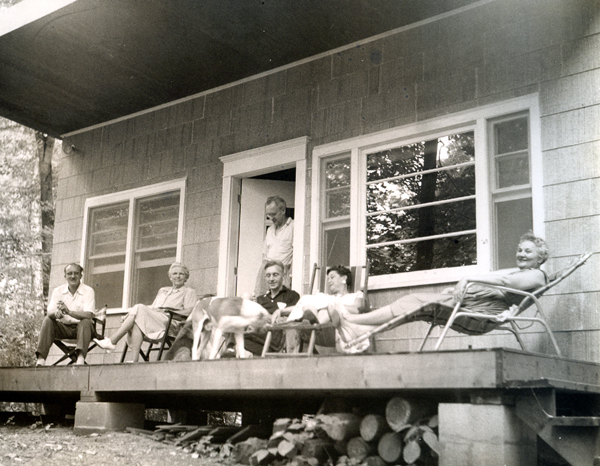 Whatever happened to the original purpose as a family summer home? My parents did use it for social get-togethers, and my dad loved going there. The photo (above) shows one such occasion, from left to right: my Uncle Bruce, Grandmother, Dad (standing), Uncle Karl, Aunt Gertrude, and Mother. But Mother, while she enjoyed partying there, never really liked staying overnight, away from the comforts of town. A year later we installed heating, allowing the place to be used all year round. Christmas parties! New Year's Eve parties! The pond was a perfect place for ice skating after a good freeze, so it was used by family and friends on weekend days, and for skating parties on Saturday nights. I even bought a pair of skates, and was able to skate without falling too often. 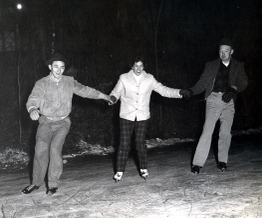 That's my Aunt Viola, her husband Fletch, and their kids Mary and Peter trying out the ice. 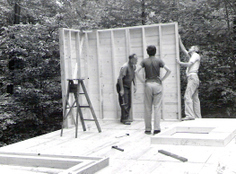 By the end of 1956 the cabin was finished, and I left for my military service. My younger brother, Richard, put it to good use after I was gone. 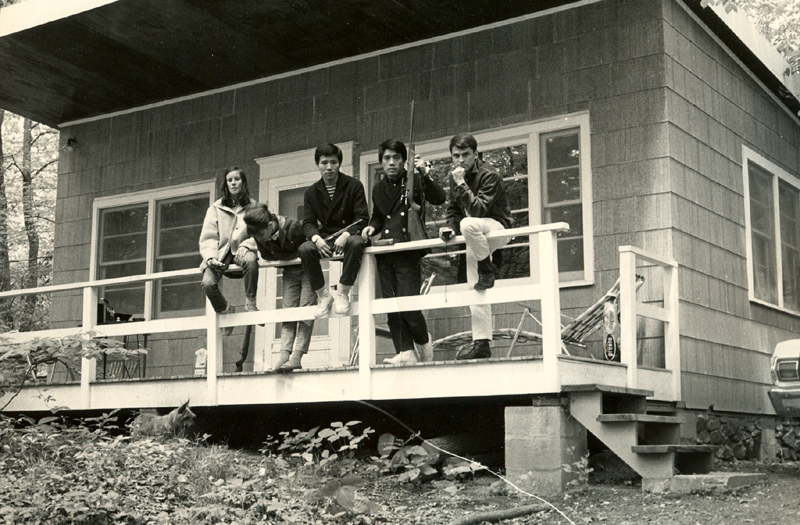 That's him on the right, showing the finished porch, or what would now be called a "deck." CLICK HERE for more later on what happened after my return at the end of 1959. A Few Related Books: Click on their titles in the boxes below for more information and reviews, and on the Buy button to purchase.